A SWOT analysis (Strengths, Weaknesses, Opportunities, Threats) is an effective way to make sure your marketing activities align with your business strategy. It means that the money you spend on marketing is more likely to produce the business results you’re looking for (more customers, larger market share, increased revenue… whatever your particular objective is). Threats (what are the main threats to your company?). 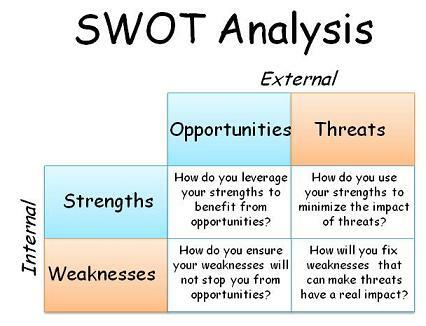 The SWOT analysis can help you find a way to use your company or product strengths to take advantage of market opportunities, and identify and work on weaknesses that might inhibit your ability to take advantage of those opportunities. To be successful, it’s important to always be on the alert for market threats. Leverage your strengths to either eliminate or reduce the impact of threats, and work to address any weaknesses that may increase the criticality of threats. Finally, prioritize marketing activities and messaging that highlight your strengths, and help you take advantage of opportunities. SWOT analysis is also included as part of our Software Company Business Plan Package and the SaaS Business Planning Package. Procrastinating Your SaaS Business Plan? Five Reasons to Get It Done! Our latest article, “SaaS Business Plan Tips,” on Software Marketing Advisor is about SaaS business planning… how critically important having a solid business plan is for software-as-a-service providers. You may ask: why should I write down a lengthy business plan? Sure, there are too many things to do already when you’re trying to start or grow a business, and often business planning does not seem as critical as the other urgent calls on your time. SaaS involves selling and delivering a standardized solution that solves a customer need broadly without too much expensive customization. Getting that right requires up-front planning: there’s little opportunity to customize during the sales cycle or during installation and still make money. SaaS usually requires more up-front capital than a more traditional software startup. That means investors are going to be looking more closely at that SaaS business plan and financial projections. Because it is newer, the SaaS business model is less proven, requiring more ongoing analysis and adjustment as the industry matures. It’s hard to determine which assumptions worked and which didn’t if you don’t write it down. One of the most important SaaS metrics is low customer acquisition costs. Without a SaaS business plan, it is too easy to over-invest in lead generation or focus on the wrong leads, leading to unsustainable marketing and sales costs. There is additional complexity to SaaS business metrics that necessitates an ongoing plan to forecast and track them reliably. It is not sufficient to simply forecast and track quarterly bookings, as with licensed software. So stop procrastinating… and start writing your business plan! This SaaS business plan template can be a useful place to start. Isn’t SaaS Just Like Any Other Services Business? It’s a big leap for a software business to go from thinking about Bookings as their main metric… to now these more services-based metrics. Then that got me thinking… Aren’t these just the exact same metrics that apply to all subscription services businesses? What about your local health club… that’s a subscription services business. I can’t say I’m an expert in the health club industry… but I bet they also track CMRR, Churn, Cash Flow, CAC and CLTV pretty closely. And similarly Bookings really aren’t what matters: who cares if you signed up 100 new members to the gym this month, if you also lost 150 member who didn’t resubscribe. If you’re planning a SaaS business, but have more of a software/technology business background… then it might be a good idea to understand a little more about how these other service subscription businesses are run and managed. Come to think of it, I think I will too!